The hollow area below your eyes and upper cheeks are the tear trough zone. Due to the aging process this area can become hollower, pronounced and shadowed, it can also occur due to genetics, sleep deprivation and stress. Regardless of the cause, the hollow can present you with a tired or worn appearance. In the lower eyelid the weakening or loss of soft tissue volume accentuate the appearance of the Tear Trough. 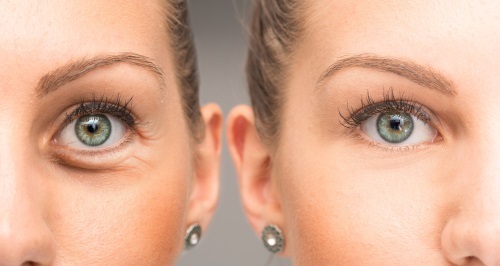 This is why people develop unattractive eye bags, dark shadows and hollow beneath the eyes. At London City Aesthetics, we perform tear trough treatments in the most natural way possible so that you can look rested and feel revitalised. Our tear trough treatments are one of the most popular non-surgical aesthetic treatments for people troubled by tired looking eyes. Do I Have To Take Time Off Work? Absolutely not! You can schedule an appointment during your lunch break and then immediately resume your usual activity. Results are visible instantly with Teosyal Redensity II, however, they will continue to get better over a two-week period. Results last approximately 6-9 months, after this time the body begins to naturally break the dermal filler and down and remove it.